Following the Royals Exhibition Game presented by Cobalt Credit Union on March 25, the Storm Chasers begin their PCL home slate at Werner Park on Tuesday, April 9. With Kansas City Royals pitchers and catchers set to report to Spring Training on Tuesday, the Omaha Storm Chasers have revealed their weekly promotions for the upcoming 2019 season. Many fan-favorite staples are set to return to Werner Park in 2019, including a record-setting nine Wiener Wednesday with Bark in the Park dates, as well as Thirsty Thursday, Hy-Vee Friday Fireworks, Bands & Brews and Family FUNday with Hardee's Kids Run The Bases. After enjoying five scheduled Wiener Wednesday dates in 2018, fans will have the opportunity for almost double the chances to chow down on 25-cent hot dogs at all Wiener Wednesday evening home dates at Werner Park in 2019. Man's best friend is also welcome for those contests to sit with their two-legged owners in the McDonald's Berm as part of Bark in the Park on those evenings as well. Thirsty Thursdays also return, featuring small domestic drafts and cans of Bud, Bud Light, Busch Light along with the new, exciting addition of Ale Storm beers available for only two dollars. 12 ounce Pepsi cans will also be available for only one dollar on those nights. The steaks will also be raised during select Thursday evening contests in 2019, as the Omaha Storm Chasers will transform into the Sizzle, with players and coaches wearing Omaha Sizzle uniforms and hats. Fridays will be a blast once again with Hy-Vee Friday Fireworks to cap Friday evening contests. In addition to the 11 Hy-Vee Friday Fireworks shows scheduled, the 51st annual Independence Fireworks Extravaganza presented by First National Bank will also return on July 4 and July 5. One Saturday each month will be highlighted by "Bands & Brews" presented by Werner Enterprises for the second straight year. For one hour after gates open, fans can enjoy drink specials, including small domestic can beer for one dollar, and live music at the Bud Light Downdraught Bar, located in left field underneath the scoreboard. Sundays will be perfect for families in 2019 with Family FUNday. Kids 12 and under will be able to run the bases after most Sunday home games as part of Hardee's Kids Run The Bases. Sundays will also feature clowns and balloon artists, in addition to visits from exotic animals from Wildlife Encounters. Pre-Game Play Catch on the Field presented by Raising Cane's also returns for six dates in 2019, allowing fans to play a game of catch for 30 minutes before a Storm Chasers home game, weather permitting. Gates on those dates (April 28, May 26, June 23, July 28, August 11 and September 1) will open 80 minutes prior to first pitch. 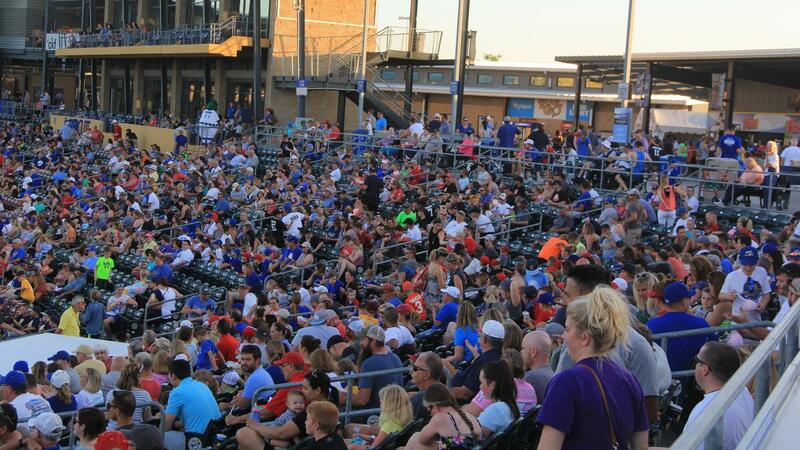 Daily promotions for the Storm Chasers' 2019 season, including all giveaways and theme nights, will be announced on a later date. Single-game tickets will go on sale beginning on March 11. Following the 2019 Royals Exhibition Game presented by Cobalt Credit Union on March 25 at 6:05 p.m., the Storm Chasers begin their regular season slate at Werner Park with Opening Night on Tuesday, April 9 at Werner Park against the Oklahoma City Dodgers at 6:35 p.m.